Smooth but rich, tart but sweet, fruity yet mellow, with a rich creamy custard but light enough to not overpower the fruit, and topped by a perfect hint of light crumbly biscuit…. 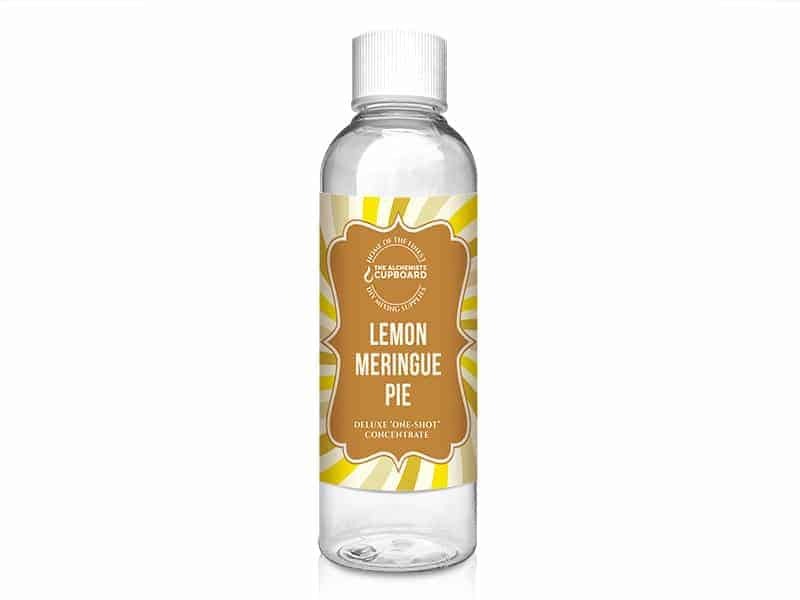 The combination of flavours will caress and tantalise your taste buds. This is a Flavour Concentrate, designed to replicate our original “Rhubarb Crumble & Custard” flavour, when mixed with the users desired ratio of VG/PG and nicbase (if required). What can we say about this lovely balanced E-Liquid? 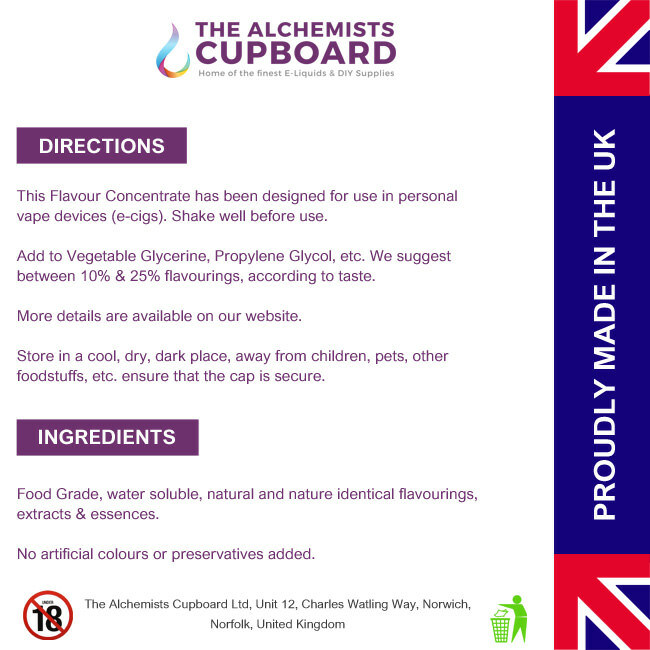 Rhubarb Crumble & Custard has been a long time in the making… It has taken a lot of trial and development, to obtain the vape and flavour hit that The Alchemist wanted. We are not going to try and describe the inhale / exhale experience…. It is a complex mix so they change at different times for different people! 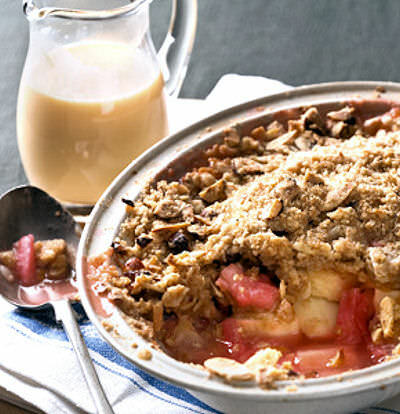 Treat yourself to a real taste of the past, Rhubarb Crumble & Custard just like mum used to make…. A classic British Dessert, just waiting to be re-discovered. Please allow at least 7 days for this Liquid to steep and develop (14 days is even better), it will reward you for the wait with a depth of flavour that you can only dream about, and you will then understand why it has become one of our Best Sellers! Go “Old School”… Try Some Today ! This is probably my favourite mix. I do a 10% mix of this and it is absolutely superb. What is the recommended steep time for this product? I’m yet to mix it, but I found the site very good all of my orders have been delivered within two days whatever method I have used. It just doesn’t get any better than this liquid and one I purchase time and time again, never tiring of the lushest flavour this concentrate delivers. (Mixed at 20% – 3 weeks steep) this flavour simply captures the sweet shop flavour of Rhubarb and Custard better than any others I have tried. This has to be my favourite from the Alchemists flavours. Sweet rhubarb and creamy custard with just a hint of biscuit. I mix at 15% and it works brilliantly. Excellent flavour (mixed at 20% and steeped for 3 weeks) Its so good i cant put it down, my only quibble would be, to me, it tastes more like the hard boiled sweets than a bowl of rhubarb crumble and custard. saying that, i wouldn’t change it for the world. Highly Recommend!